Following their well-received 1983 7” ‘Valhalla’ London’s Desolation Angels recorded their self-titled debut album in 1984, the year Venom headlined Hammersmith Odeon; but record company problems meant that by the time it finally saw the light of day two years later Bon Jovi were doing four sell-out nights at the same venue and the metal music world was a very different place indeed. As such, what would have been a sterling NWOBHM release was overshadowed by poodle-permed rockers on the one side and thrash metal maniacs on the other, and with the music press unsympathetic to the NWOBHM’s heritage the album’s fate was pretty much sealed the moment it was released. 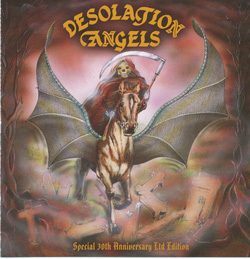 ‘Desolation Angels’ deserved better at the time, and a slightly-belated thirtieth anniversary edition has finally made the album available once more. For a point of reference the band – vocalist Dave Wall, guitarists Robin Brancher and Keith Sharp, bassist Joe Larner and drummer Brett Robertson – sound something like Sabbath genetically spliced with Maiden. Songs evolve unhurriedly over time – eight cuts in forty-four minutes indicates that the band weren’t in any hurry to curtail their songs before they’d said their piece – with strong, solid riffs underpinning some intensely heavy (for the time) material as evidenced in opener ‘Spirit Of the Deep’ and ‘Wild Gypsy Woman’. The supercharged ‘Death Machine’ takes things up a pace, and when they wanted to come up with something catchy they weren’t short of ideas, as the toe-tapping shuffle ‘Unsung Hero’ proves.